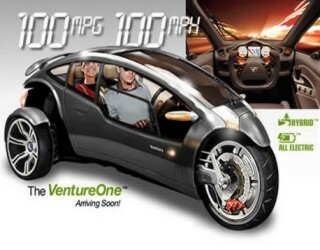 Introducing the VentureOne, a revolutionary 3-wheel, tilting, plug-in Hybrid vehicle. This unique 2-passenger flex-fuel Hybrid vehicle will achieve 100 miles per gallon, accelerate from 0-60 in 7 seconds with a top speed of over 100 mph, yet at a retail price of under $20,000. And if that weren’t enough, imagine combining the performance feel of a sports car with the agility of a motorcycle. It adds up to an exhilarating driving experience that can only be compared to flying a jet fighter two feet off the ground. The VentureOne is a fully enclosed vehicle that is surrounded by a steel “safety cell” and other safety features typically found only in cars—things like side impact beams, driver airbag, rear bumper and engine shield. While the same height and length as the MINI Cooper, the driver in the VentureOne sits as high off the road as a BMW 3-series. When combined with its 360° glass canopy effect, the VentureOne not only provides a driver with tremendous road visibility, but will add to a sense of overall driving confidence. The VentureOne is a revolutionary new vision in transportation. The VentureOne will weigh approximately 1,400 pounds in prototype form, with an overall width of 48 inches, a length of 11' 8", and a 106 inch wheelbase. The engine will be located in the rear of the vehicle at a low height. The passenger compartment and the front wheel will tilt when cornering; however, the forces will be aligned with the vertical axis of the driver’s body, resulting in the driver being pressed into the seat rather than pushed across it. The VentureOne will have an enclosed body. The reinforced roll-cage construction in combination with front-and-side-impact protection, and a highly efficient passenger restraint system, give the occupants a level of protection comparable to conventional cars. Venture Vehicles plans to initially offer two propulsion packages for the VentureOne: the hybrid E50 and Q100, and all-electric Venture EV model. Manufacturer's Suggested Retail Prices (MSRP) will range from around $20,000 for the E50 Hybrid, to $25,000 for the all-electric EV model – with a wide range of accessories that will be available for each. All three classes will incorporate the patented Dynamic Vehicle Control system, or DVC™, developed by Carver Engineering, which allows the vehicle to tilt up to 45° side-to-side at a rate of 85° per second. All three will also feature ventilated disc brakes and measure 3.5 meters in overall length. The vehicles’ propulsion system is of a series hybrid design. The system consists of a small internal combustion engine connected to a 15 – 20 kW generator, a 50 kW drive motor, a four gallon fuel tank, and an advanced high capacity battery pack. The system will be able to take energy normally lost as heat due to braking and return it to the battery, increasing overall system efficiency. Both Hybrid versions will achieve 100 mpg, with speeds of over 100 mph, and 0-60 in 7 seconds or less – a major breakthrough in the automotive industry.